ROMANOV is a wonderful YA historical fiction which weaves magic into the story of the Romanovs. This book completely hooked me from the start and did not disappoint with twists and turns and magic and romance that added new elements to the story we know. The book begins with the Romanovs in exile at Tobolsk. The Bolsheviks are keeping them under lock and key fairly loosely at first but the restrictions begin growing over time. Anastasia (primarily called by her nickname Nastya) is 16 years old when this has begun and looks to her father for guidance. He has endless patience and forgiveness for the soldiers who he views as also trying to do the best for Russia. 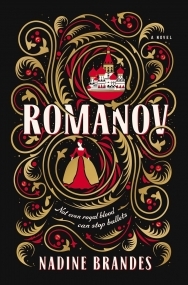 Things begin to change when her father, mother, and sister are taken to Ekaterinburg, and Nastya is given a task by her father to protect the Matryoshka doll which was gifted to her family by a powerful spellcaster. As Nastya takes this mission, she must work hard to keep the doll safe and to know when to use the spells within. She is also trying to help her brother, Alexei, who has hemophilia, and is often in pain because of it. Nastya wishes she knew more spells to heal him rather than just take away the pain, but she is also running out of the spell ink she needs to cast these simple spells. As Nastya and her siblings travel to join their parents and Maria in Ekaterinburg, they know that everything is changing for their family for the worse. Centering around Nastya and her hopes, dream, and dedication to the mission given her by her father, this book is anything but boring. If you know the story, this follows the history pretty closely- with the added element of magic and some new characters in the soldiers who guard the Romanovs. The first half of the book consists of a lot of character, setting, and world building; however, I found it anything but dull. I was completely caught up in Nastya, her siblings, her parents, and the Bolshevik soldiers for whom they came to care. The second half contains the death and bloodshed that are to be expected in such a story, and we felt as Nastya does, connected to these characters who will face the worst. Nastya is such a great character and so insightful at 16/17. She sees what is happening with her family, with her sister, with the soldiers, and views it from many perspectives. She has the heart of a troublemaker and uses this to help her family as they are under lock and key. Nothing is so black and white, and I think this was beautiful. The added element of magic was interesting- this is different than the typical magic, requiring spell ink and knowledge rather than the usual formats you will see in books, and this felt really unique. With some added romance for Nastya, full of the push and pull regarding the situations and decisions they will face, this book has something for everyone. I absolutely devoured this book, and I highly recommend for people who like cross-genre YA. This is a book not to be missed!